Oct. 26, 2011, 11 a.m.
Cody Brown and Kate Ray launch a new tool to help non-coders design on a story-by-story basis. By Megan Garber @megangarber Oct. 26, 2011, 11 a.m.
PaperNews wasn’t, ultimately, funded. 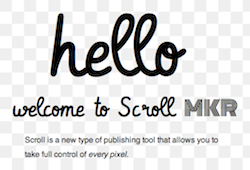 But part of its spirit lives on in Scroll, a new editor that aims to de-templatize news design. The tool, created by soon-to-be-serial entrepreneurs Cody Brown and Kate Ray, wants to take the basic design approach of print — start with a totally blank page, add elements — and apply it to the online world. On the web, though, most news sites dump every news story into a single — or, if they’re lucky, maybe a handful — of predefined templates. Those templates might be terrible or they might be great, but they generally render the news with all the style of an assembly line. A few special projects each year might get a special design treatment, but that often requires collaboration between coders and designers whose skill sets don’t overlap. Which is the point of the without needing to know how to code kicker of Scroll’s elevator pitch. Tools like Scroll — a lightweight editor that generates html and CSS — can put journos of the coding and non-coding varieties on, literally, the same page, allowing them to collaborate to create online news experiences that mimic the intimacy and immersiveness of print. The history of WYSIWYG apps designed to make web design accessible to non-coders is long and not particularly filled with glory; most produce klutzy, bloated code that doesn’t work as well or as quickly as the product of actual coders. But Scroll’s code, at first glance, at least seems not to suffer from that problem; the growth of web standards and of grid-based web design has made it easier to generate pixel-tuned designs without relying on the hacks of the early web. POSTED Oct. 26, 2011, 11 a.m.